For two years I've been a partner artist with Michele through the Art of Recovery, a program sponsored by Seacoast Mental Health Center (SMHC) and the New Hampshire Art Association (NHAA). The event raised more than $22K in its first two years - now hoping to add to that number this week at the third annual event. My partner, Michele, triumphs through accident-related brain injuries. She is one of the strongest women I've ever met and a fierce advocate for her young daughter. As a single mom, her days are long and devoted to her child and her work, but she has found peace and tranquility in art. We've worked together since early 2015, but this year I have become mainly Michele's cheering squad and biggest fan of her artwork. Ideally, the program calls for us to meet and create artwork together, but too much got in our way towards that effort in these last few months. Still, Michele produced more art than was requested for the auction. She's a prolific and wonderful artist! Often, I'd receive a text and photos of her work - I can only sit back and applaud, amazed at what she accomplishes when taken altogether. We've made a connection beyond the AOR organization. Once my knee replacement allows, we have much to look forward to this summer. Meditation classes, photo sessions at local horse farms.....or just catching up before the next year's event kick-off. Here's looking to the future and more art time together, Michele! Michele's display of watercolor paintings at last year's AOR silent auction event. When I was working for a small Hartford computer graphic design shop in the late 80s, I worked a 12-14 hour day as the sole designer on a computer graphic design station. We were busy with a new client with a ton of signage they wanted for an upcoming convention, as well as a handful of very demanding (but fun to work with) design groups. My day started out with an hour-long commute north to Hartford - if I was lucky - and ended with the same commute going home in the dark. We had just moved to southern CT and barely knew our neighbors. I often left for work in the dark and returned in the dark. Our weekends were filled with fixer-upper jobs on an old home. Our real estate agent - a nice, motherly woman of about 50 - warned us against a fixer-upper, but our budget didn't allow for some of the updated homes in that area they called the "platinum coast" of Fairfield County. Dave's commute was easily longer than mine, even though in miles it was shorter. I-95 or the Merritt Parkway during commuting hours always posed a traffic nightmare if you didn't have a reverse commute. We had little time to engage in our community in that first year. Almost as soon as we moved to CT and I started my new job, I found I was pregnant. I worked for 7 months with the hours mentioned above until a day in my last trimester my pregnancy went sideways a bit and I needed to take the final 2 months off. A nightmare for the little design shop I worked for, but a bit of unexpected heaven for me. I finally started to acquaint myself with our little town. I also spent quite a bit of my time seeking inspiration along the coast for art projects. I had it in my head that I would reacquaint myself with my watercolors and use my maternity leave to cultivate an art environment at home that would include my new role as a mother. When my son came into this world, he was such a gift! There's no denying the many tremendous wonders of having a child. No way to fully describe the profound love. Having said that, there is also no way to know just how much your world does change in that moment. Justin was born in one of the hottest summers on record (my record, anyway) and we had air conditioning in only one room of the house. Plein air painting in that kind of heat was alone a joke, imagine thinking of bringing a newborn along to swelter with me. We existed those first few weeks in that lone room with an air conditioner, rocking chair, television, books and my art supplies. My son didn't sleep much, or at least not for long periods before waking up and screaming his little mighty lungs out for various needs. Mornings were cooler, and we could sit in the living room and watch the sun slant over the woodwork and knick knacks I had decorated the house with. I would rock him to sleep, well-fed, clean and cool, and peacefully muse over my world, small at the time as it was. It was in those quiet, peaceful moments that a seed of an idea started to take root. Since I couldn't take my son and my art supplies off-site to paint, what stopped me from finding inspiration in my home, where we were never more than a few steps from our world? The sun streaming in over glassware on shelves and silver pieces, flowers, and even glass tumblers used for coffee became my muses. Light play through glassware made patterns on the surface they sat on that are still so mesmerizing to me. This is the kind of thing that inspired me when I had my first - and only - class in watercolor back in college. Close up studies of how light interacts with reflective and refractive elements. Thus began my foray into the world of still life. Over a quarter century later and it's still my second love, born almost from the moment my first love came into this world. And so it began there, 28 years ago. Housebound and feeling creative juices overflow for a traditional medium as the computer graphic world started to grow a bit mundane. For years I'd been captivated by computer graphics as a visual tool to express myself creatively. Staying after hours to create artwork above and beyond visual support for the job. All my side artwork was used to promote the equipment and the employer, but I loved the challenge of pushing the system to it's creative limits. Only, at some point it became a tool for deadlines two days ago and hair-on-fire revisions requiring hours of extra work and stress off-the-charts, and less a means to a creative outlet. I longed for a way to create meaningful art that fulfilled and sustained me, and, most importantly, fit beautifully with my new role as mom. I found that with watercolor - a challenge of another sort, but equally as fulfilling, if more so, than that provided by computer program. I think of this time as I sit here in the shade of our sunbrella on the patio, with my leg elevated to ensure the swelling from surgery is properly attended to. It's been nearly three weeks since my total knee replacement surgery, and I can't help but remember back to the same kind of naive expectations I once had when I became a mother. That belief, before taking the plunge of surgery in this case, that a few weeks out I'll be doing quite a bit more than what in reality is on the plate. It's no wonder that in the class they offer at the hospital on what to expect with knee and hip replacement surgery they bring in a veteran of surgery whose replacement was over 6 years ago. Like natural childbirth, knee replacement surgery seems a lot less traumatic from a point 1 year or 2....or 6...out. There's much to consider in recovery from TKR. Like childbirth, the rewards are long and simply wonderful. A new knee that allows me to once again hike and enjoy physical activities I've long been limited by arthritis from participating in is the great focus right now. But there is a window of time that the miracle of life and rebirth of a knee can take it's bit of a toll. Half-step backwards is a daily occurrence for every full or two steps forward. Pain, and the side-effects of pain management don't end after the first initial week or two. Months of physical therapy to get the knee fully flexible around the inevitable swelling and realignment issues of back, hips and feet require a hit of pain-blocking in the form of a trusty pain med. Can't get that holy grail of 120 degree bend in the knee without it! And that's just in the first weeks out from surgery. The full flex is necessary to win over the scar tissue that will hamper forever the inner workings of the knee if the flexibility isn't fully addressed. Want to hike Mt. Chochorua (or even the Marginal Way) with ease again? Get that knee fully flexed as soon as possible. I'm at 105 nearly three weeks out, with almost full straight inversion (back of knee on the flat of the bed), which is good. I was 110 a week ago, but got set back by over-confidence. That's all it took to lose ground. Icing and elevation is key, and there is no way to get around avoiding it without facing set-backs in recovery. I have my studio set up now with an ottoman to rest my leg on as I paint. Not perfectly comfortable, but it works. For at least 6 weeks, this will be the drill - rest, elevate, ice, exercise, and repeat. Patience and finding a way to fit the creative into the therapy and recovery. Finally, what this recovery time of ice/elevate and rebirth (of knee, if not me) has offered a time to recoup, and reconnect to what matters most. My life in art is growing still - I have much I want to do in the years to come. Moving to Portsmouth created new challenges to my work as an artist, a world I'd become so comfortable in took a left turn to a different setting. Beautiful and bucolic this setting may be, it's one that didn't automatically fit on the same artistic stage I'd set for myself for nearly three decades. Southern CT and the NYC arts world was and is still (even after the economic blowout of 2008) different than coastal New England. I am not a painter of water scenes, boats and the surroundings of the quaint community we now live in. Initially, I saw that as a deficit of my own making. For a few years after we moved here, I believed I needed to change my genre and evolve from the inspiration I found so many years ago as a new mom. In 2011, the economic climate had just begun it's slow turn back towards healing and the art world I moved from took on a new kind of sideways from a course I never once considered straying from in 25 years. I know I'm evolving in my painting process, my subject matter, my relationship with other artists and galleries. The rejections and rewards still come in interesting, subjective and damnable patterns. One minute the world is my oyster, the next it's filled with doubt. But always, always, I can take comfort in seeing marvel and joy in the eyes of people - normal, every day people - when they discover the depths of detail and beauty in a painting, and find inspiration, amazement, thrill and peace in just taking in a work of art that touches their heart. Sales are good, but the sheer appreciation of skill and craft are equal parts rewarding and justifying the effort. I've added animal portraits to my repertoire, initially as a means to give back in the form of silent auction donations to the efforts of animal rescue. But the portraits admittedly give me a kick to create. They are a quick diversion from my still life work and provide a nice - and thoroughly charming - means to connect with more people. I work on commission as well with my portraits, and donate a percentage of the proceeds to a shelter or rescue of the client's choice. I think it helps....both the rescued animals and my soul. I love what I do. Looking forward to getting back to it full time again and hiking, kayaking, SUP boarding - you name it. The world is out there! This is Willow. She left this earth roughly a year ago. Almost completely blind when the reference photos were taken, her family wanted to show some of the detail of the blindness in her eyes since it was a part of who she was in their lives. From her perch on a window sill where this pose was taken, you can see she was acutely aware of her surroundings, and a beauty to boot. When I paint an animal portrait, I like to know the details of their lives - their personality quirks, their afflictions (if any) and their story/history. Anecdotes are a wonderful part of the process, since I usually don't get the opportunity to meet the pet I'm painting and so much of what has to come through depends on the character beneath the surface. I like to see that spirit come through in their eyes. This portrait focuses on Willow's 'gaze' - guided mostly by senses other than sight. At peace, yet alert. Her ears perked, her whiskers curved forward. She was in her groove. Creating portraits require certain guidelines to turn out well. Photographic references are key, especially when the subject lives far away. The best references are taken in natural light, either outside (watch out for dramatic shadows that mask the details of the face and eyes) or inside near a window or source of diffused sunlight. Unnatural light - flash, for instance - will compromise eye detail and fur color. High resolution photos help when I need to zoom in for detail, in the case of long distance shots. When taking a photo of your pet, try for indoor setting with lots of natural light coming in from a window or door, or take your pet outdoors. Lots of photos will show full body detail, but little face information. For me, the face is the focus - where the character I seek to paint is in full view. Aiming for a variety of shots that include close ups of your pet's face is best, making sure the eyes are in sharp focus and clear of shadow. I want to see that eye color! I can and do often tweak photos on Photoshop to suss out details in under-exposed shots. You pet shows so much through their eyes, let that be the focal point for your photos and for your portrait! Willow's portrait is part of multi-tasking duo that I've been working on for a couple of weeks. Multi-tasking my paintings is one way I can hit the refresh mode, switching from one to another over the course of the day. I've been working on Willow (the little blind black cat) and a small still life in conjunction with each other. It feels a bit like a brain challenge or puzzle to work on these two pieces since they represent two very different genres, a kind of right brain multiplex. I'm missing my work, the studio - the peace I feel there. For now, though, the paintings are on hold for a short holiday. A week ago today I had a total knee replacement and am currently keeping myself from undoing the good work of orthopedic surgeon. Lots of PT is involved and more icing than I thought possible. But just a week out and the icing and dogged exercises have done their magic so far. My focus has been on pain management, ingesting fiber (important!) and getting the knee back on track before I think about fixing the other one. Later this week, the stairs and my studio beckon. It will be more than a month before I'm walking normally and pain-free, but at this early stage, it looks really good. I look forward to the day when I can climb the stairs without looking like I'm 90 years old. At the moment of capture. Working as an artist, one of the issues I've run into is that once a painting is sold, if I don't have it digitally archived it's gone from circulation for good unless the buyer resells the original. Creating a continuing revenue stream on sold works by way of reproductions is beneficial to the artist and enhances the value of the original and investment for the buyer. The option for a high-end print of an original is a cost-effective way for an art lover to own work without the often daunting price tag of the original piece. To ensure that I have access for quality reproductions of paintings that are sold and out of circulation, I have for many years worked with various print houses to recreate my my original works on watercolor paper using a high-end large format digital printing process often referred to as Iris prints (or Giclèes). The results varied wildly during the initial stages as the on-demand printing starting to evolve, with the most frustrating part of the process involving proofing the prints and adjusting levels in a seemingly never-ending cycle of visits to the printer. The last printer I worked with had a good eye and the results were often spot-on within two visits, but typically, the proofing cycle could involve so many more visits to fine tune the print. The challenge for me has always been to find a printer with the visual perception to produce a reproduction with an excellent approximation of the original painting. Unlike most print houses, Camera Commons in Dover, NH, (described on their website as "for photographers by photographers", but as a visual artist I found they are really so much more than that) provides the opportunity to personally control the final product - from digitally archiving my original work, to printing a high-end reproduction on quality watercolor paper. Now I can rent time to shoot my work to digital file, refine the levels at the computer via Photoshop and output to final print on my own schedule. A bonus: that the pricing is very reasonable! 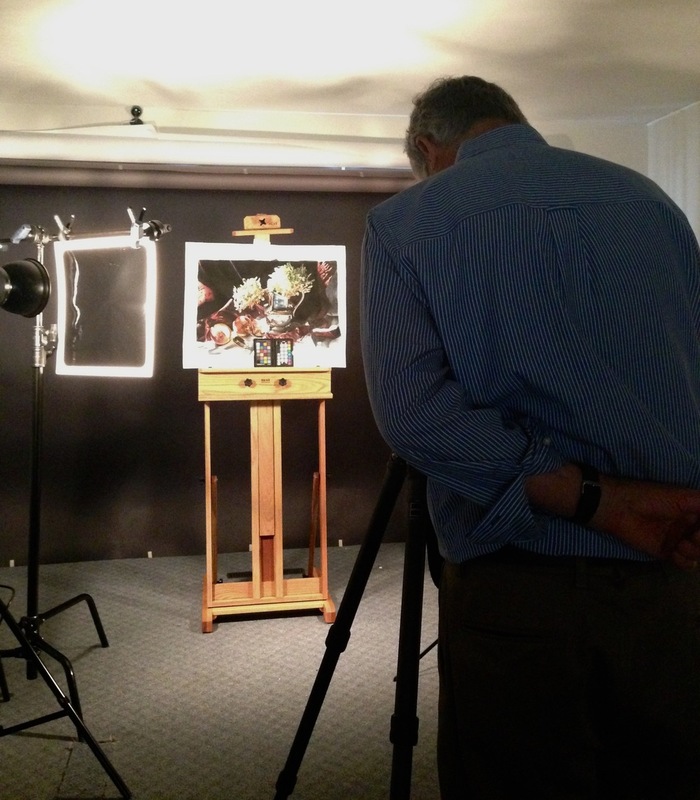 David Speltz, photographer and the mastermind behind Camera Commons, graciously invited me to bring in a painting to see what kind of results we could achieve working together, and to provide me with the potential means to do this work myself in his studio space. What a concept! I brought two paintings to choose from to take through the entire process, digitally archiving with a digital camera to final output on Epson Watercolor paper, exclusively processed for reproduction work. I chose "Late Summer" (featured above) for it's depth of shadows and brilliant white highlights. I wanted to see how well the deepest values would print without compromising detail in the highlights and sunlight elements of the painting. Once the work was photographed on a tripod using a Betterlight Scanning back and a Digital Hasselblad and studio lights, we then were able to enhance the image through Photoshop and Lightroom to the point that it was virtually identical to the original artwork. The computer programs and monitors at Camera Commons allowed me an approximate view of what the printer would produce, and it was as spot-on to the monitor's visual calculation as one could hope for. Using a RIP (raster image processor) called Mirage on the computer, the final print-ready image was then sent to one of three Epson printers: the Epson 9900 which could accommodate prints up to 44 inches wide (and as long as you wish). Also in-house is an Epson 7900 for prints up to 24 inches, and a smaller Epson 4900 dedicated to matte prints only. The finished image was then printed to Epson Exhibition Watercolor Textured paper to mimic the paper properties of the original watercolor painting. There are print houses that offer the equipment and expertise to produce a high-end reproduction with a price point not too much out of the same range as do-it-yourself. However - and for me this is a big part of the appeal of Camera Commons - being able to control the reproduction proof as easily (I am not kidding) as we were able to, and within a space of just a few hours was serious selling point. To professionally archive artwork in high-definition for future print projects, or even to have for online art shows, references for galleries and uploading to a professional website and blog is good practice for any professional artist. Renting the space and equipment for the afternoon to archive my work moving forward will be my next step. Starting fresh today with a body of new work. Keeping it interesting with two works at once! --- A portrait and a small still life. "Water & Light" is now displayed in the Robert Lincoln Levy Gallery, at the New Hampshire Art Association in Portsmouth, NH. The show features my latest work and the extraordinary digital b&w photographs of my friend, photographer Michael Sterling. Combining my colorful watercolor still life paintings with Michael Sterling's stark and striking black and white digital photographs made for a compelling show! I was so proud to hang my work next to Michael's. Michael and me after an exceptional night!